Leading Manufacturer of inline magnetic separator, eddy current separator and hopper magnet from New Delhi. 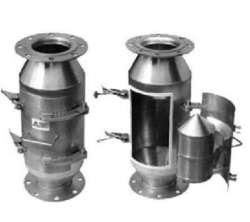 These separators are adaptable to either round pipe or rectangular chute transfer lines. The Hump Magnets employs two heavy duty plate magnets, which are positioned so that the offset flow of material flow through the hump is forced into the hump housing for maximum product and dust contaminant during processing operations. They are used in the food, rice, flour, plastic and other industries to remove ferrous fines, as well as large pieces of tramp,iron from many types of dry particulate or clumpy. Easily remove captured metal, manually. Available For 4” And 6” Line Or As Per Customers Specifications. An eddy current separator uses a powerful magnetic field to separate non-ferrous metals from waste after all ferrous metals have been removed previously by some arrangement of magnets. The device makes use of eddy currents to effect the separation. Eddy current separators are not designed to sort ferrous metals which become hot inside the eddy current field. This can lead to damage of the eddy current separator unit belt. 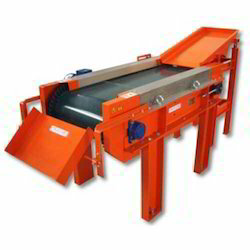 The eddy current separator is applied to a conveyor belt carrying a thin layer of mixed waste. At the end of the conveyor belt is an eddy current rotor. Non-ferrous metals are thrown forward from the belt into a product bin, while non-metals simply fall off the belt due to gravity. 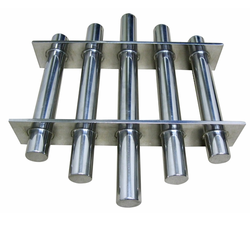 Looking for Permanent Magnetic Separators ?